The long awaited 360 camera from GoPro is almost here. The introductory price, $699, is a bit higher than competitors, but it might just be worth it. 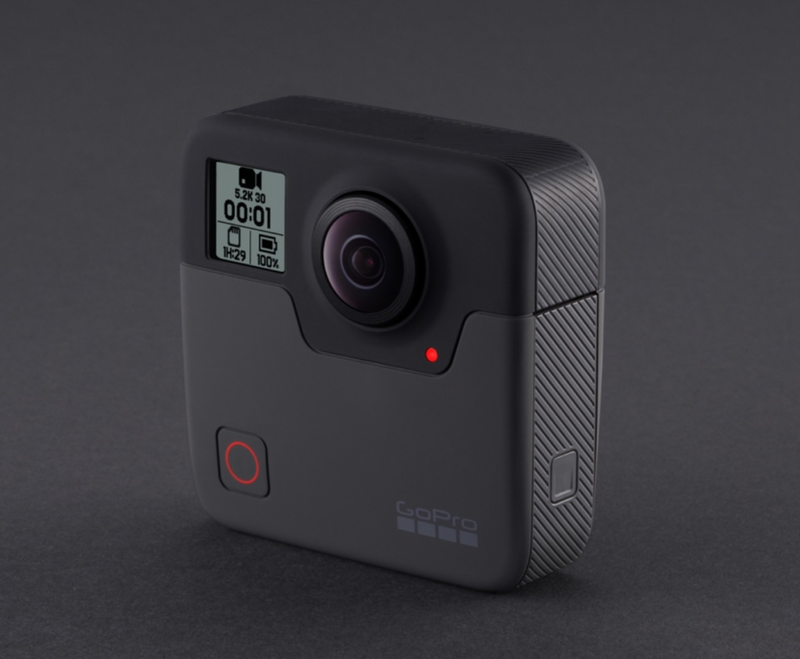 Looking like a Hero 6 on steroids the Fusion is has the signature square look that GoPro has used since the company started. The outside has almost the same basic layout of two buttons and a small menu screen. Like most 360 cameras, it is best controlled through an app on your smart phone. To connect to the Fusion, there is a USB Type-C connector, which is the same as all the newer GoPro models. It uses different batteries but than would be expected due to the additional power needed to run two cameras. It does use the traditional GoPro mount which is a plus if you have a box of mounts and adapters you have collected over the years, like I do, from your other GoPros, or if your new to GoPro, you can get the ¼-20 adaptor mount and put it on whatever you want. The Fusion can shoot in 5.2k resolution, which is nice, and also records audio in 360 degrees so your sound will follow the video. You will be limited to 30 fps at 5.2k but can shoot 3K at 60 fps. It’s not all about video, it will capture 360 degree still images at 18mp and will do also do time-lapse. Of course it has all the usual technical goodies – Bluetooth, Wi-Fi, GPS, accelerometer, gyroscope and compass, but one of the best features is image stabilization, always a big help if you’re walking around or riding on something. It is not made for diving, but the Fusion is waterproof up to 16 feet. Pool shots and beach waves should not be a problem. The video is recorded to 2 Micro SD cards, one for each camera, but the software knows which file goes where and puts it all together. The real trick pony here is OverCapture. What it does is allow you to take your spherical video and crop it into a standard 16×9 HD fixed frame. You can pan the video, zoom in and out and even pull out to the little planet look, something I’m sure you have seen for other cameras. 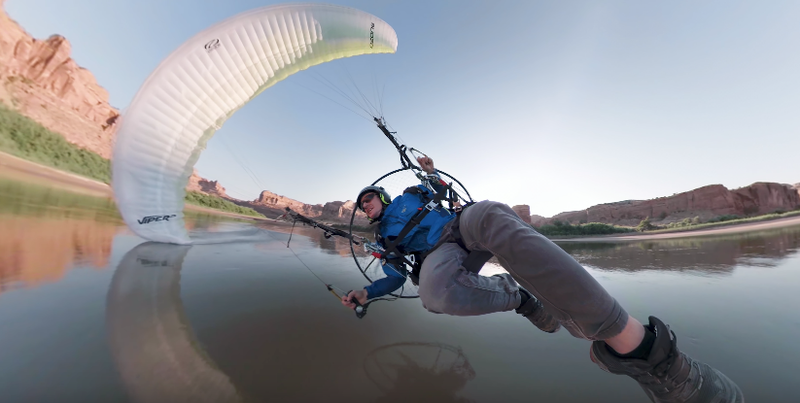 If is it like Gopro’s other software, The Fusion Studio software should be easy you use and you can guide your viewers through your selected angles of the video you captured in 360. You will never miss a shot again! The camera stitching in the preproduction model that I have seen has been excellent. A nice accessory that has been included with the Fusion is a telescoping pole. It will allow you to get the camera away from your body from just about any angle. By having the camera farther away, it allows the software to use what is called “Angel View”. It steaches out the pole automaticly, so the pole with never be visible in the final footage. By doing this, it creates the effect of the camera floating in front of you. OverCapture will eventually be an app on your phone than will make creating videos quick and easy, but is will be early 2018 before that is available, However, the desktop version will be up and running with the release of the camera. I liked the idea of GoPro’s Omni rig, (using multiple Hero cameras to capture all 360 degrees), but the hassle factor of dealing with 6 cameras, batteries and cards, not to even mention the $5000 price tag, limits it’s usefulness when a quick setup is needed. The Fusion, granted is aimed at being more of a consumer camera, may be able to be a more useful tool as opposed to the bigger rigs. I know I have found myself using the little Hero cameras more and more on high end productions because of their size. I guess size does matter. Though the Fusion is priced higher than most of its competitors, the combination of camera, accessories and software, easily justify the additional cost. Image quality and usability will remain to be seen once it is in the hands of the consumers. I, for one, have anted up the cash to be able to take it out for a spin and hopefully I will not be disappointed. I see the Fusion filling a gap between lost cost 360 cameras and the high end rigs, opening up opportunities for video creators to reinvent our viewing experience. I will update you next month with more details once I have the Fusion out in the real world. Let me know what you think. Leave a comment below. If you have questions, I will do my best to answer them.